Resource Center What Are the Different Types of Intervention Techniques? What Are the Different Types of Intervention Techniques? Addiction is a brain disease that impacts individuals, their families, and society as a whole. An intervention is a way to help a person recognize that their drinking or drug abuse is creating issues, with the goal of getting them into a specialized treatment program that can facilitate sobriety and sustained recovery. An intervention is a structured meeting between family, friends, neighbors, clergy members, coworkers, and loved ones with the individual who is struggling with addiction. If a person has a history of violent or self-harming acts, suffers from a co-occurring mental health issue, or is taking more than one mind-altering substance at a time, it is often recommended to have a trained professional on hand for the intervention. In all situations, however, a professional interventionist can help to facilitate the entire event, from the planning stages to escorting the individual to treatment. The National Council on Alcoholism and Drug Dependence (NCADD) publishes that almost all (around 90 percent) interventions are successful in getting individuals into treatment when a highly trained and experienced interventionist is involved. 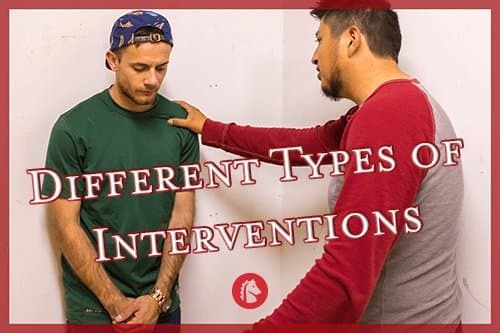 Since addiction does not manifest the same way in everyone, there are several different types of intervention techniques to choose from. Generally speaking, there are interventions that do not involve the person in question until the final meeting, often termed confrontational interventions, and those that invite the subjects of the intervention to be part of the process from the beginning, called invitational techniques. The main goal of any intervention is to get the person into a treatment program following the meeting. The Johnson Model is what most people probably think of when they hear the word intervention. It is a classical style wherein the family members and loved ones of a person struggling with addiction is confronted with a surprise intervention in the hopes of getting them to see their drug and/or alcohol use as an issue and to agree to get help. An interventionist, or team leader, works to engage a person’s social network to plan a structured meeting without the knowledge of the person in question. This network, or intervention team, meets at least two times, as indicated by the American Psychological Association (APA), before the final meeting (the actual intervention) where the individual who needs help is confronted. Intervention team: A group of people from a person’s social and family network are gathered together to form the intervention team. A trained professional can help to head up the team and work to compile and organize a beneficial group of people. Planning: An intervention requires careful planning and organization for the best results. The final meeting needs to be well-structured and planned for a time when the individual is not intoxicated, tired, or otherwise stressed if possible. A calm and safe environment should be chosen as well. Care-focused: Families and loved ones should be assertive without being hurtful. The person is to feel loved and cared for throughout the entire process. Letters and evidence: Members of the intervention team write letters ahead of time detailing specific instances in which the addiction has personally impacted their lives. These letters should point out facts and be as nonjudgmental as possible. Focus on addiction only: Other issues from the past should be ignored during the intervention, and only issues surrounding addiction should be addressed. Treatment as the main goal: The overarching purpose of the intervention is to get the individual to commit to entering into a treatment program. Family members and loved ones should prepare strict consequences that will be upheld if the individual does not agree to seek treatment. Options for treatment: The intervention team researches and outlines three different treatment options for the individual to choose from, so they can enter into a program as soon as possible following the final intervention meeting. The Johnson Model strives to show individuals who are battling addiction that the disease is not only harmful to them but also to those around them, and that their loved ones and family members want what is best for them. Ultimately, this is for them to get professional help in the form of an addiction treatment program. In contrast to a confrontational approach wherein an individual is surprised by the intervention meeting, the invitational technique involves the person struggling with addiction as well as their families and loved ones throughout the entire process. With an invitational intervention model, there are no secrets or meetings. One such model, called the ARISE (A Relational Intervention Sequence of Engagement) Intervention, was developed as a research-based protocol involving three main stages working through a continuum of care. Once the individual suffering with problematic substance abuse agrees to enter into a treatment program, the intervention is stopped. Stage 1: The first stage of an ARISE Intervention is when a concerned loved one, family member, or caregiver calls a trained interventionist and is provided with a free phone consultation. They are coached on how to best gather the necessary loved ones, the social network, and the individual needing help together for the first meeting. The meeting is led by a professional who is specially trained and certified in the ARISE method. Stage 2: This stage involves the “Intervention Network,” or the social support network, as a unit so no one person is to manage the process. Two to five meetings may occur during Stage 2. Stage 3: The meeting in Stage 3 is considered the formal intervention where strict consequences are put into place if the individual does not agree to enter into treatment. The ARISE Intervention depends on a supportive Intervention Network to work together out of love and directly with the individual in need to help them make the commitment to enter into a treatment program willingly. The Family Systemic Intervention is also an invitational technique that involves families and individuals battling addiction. This method works with entire families to improve the dynamics and inner workings of the family unit in order to foster recovery. Individuals are invited to attend the intervention where a trained professional works with the entire family, instead of focusing solely on the person suffering from addiction. This approach helps whole families enter into treatment together. Instead of one formal intervention meeting, there may be several meetings over a period of weeks or months. These meetings include conversations that are directed by a professional. The goal of a Family Systemic Intervention is to get the entire family into some form of treatment. Addiction disrupts entire families, and AIS publishes that recovery may be best served when loved ones are all involved in the treatment program together. Much of the time, an individual will enter into addiction treatment, and family members will attend family therapy, counseling, support group, and educational sessions.